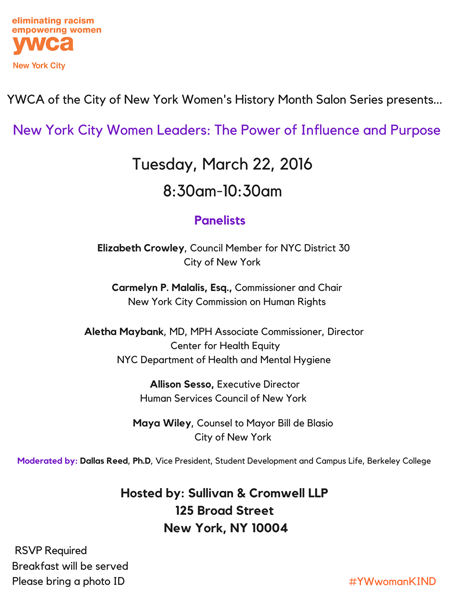 The YWCA NYC is having its third breakfast panel for Women’s History Month “New York City Women Leaders: The Power of Influence and Purpose” hosted by Sullivan & Cromwell LLP. This conversation will provide a platform for women leaders in New York City government, corporate, and social sectors to raise awareness around key advocacy and equity issues. Breakfast will be served! To attend the event, please RSVP here. Registration is limited: reserve your place as soon as possible. Click here for panelists bios!